Grand Prairie Baptist Church was organized on November 26, 1843 in the country home of Richard and Nancy Swon. There were 21 charter members. By December 23, 1843, membership had grown to 46 and services were held in a log school house. On January 3, 1844, the church purchased two parcels of land on State Road E three fourths of a mile northwest of Auxvasse. The Grand Prairie Cemetery remains at that location today. Three houses of worship were erected at that site. Two were built of logs and stood in what is now the Grand Prairie Cemetery. The third was a frame structure and stood north and across the road from the cemetery. In 1882 the church building was moved to Auxvasse and rebuilt at it's present locaton on a lot probably donated by Nancy Swon. Church members met in the Methodist Church during the time that the church was being rebuilt. Sadly, this church buiding burned on June 24, 1896. At a special meeting held in the Christian Church, an offering was taken to rebuild. 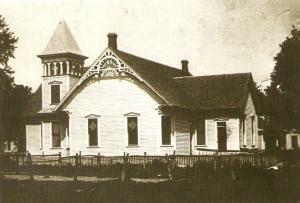 The new church was constructed and a dedication ceremony was held on June 23, 1897. It is the sanctuary in which services are held to this day. By 1960, the church had outgrown this new building and the first brick addition, behind and south of the orginal building was added. The two lots lying south of the present church building at the corner of Main Street and Harrison Avenue, now serving as the church parking lot, were purchased in 1973 and 1977. A second addition, constructed of brick to match the first, was built during the period of 1999-2000. Three volunteer construction teams from baptist churches in Kansas, Texas & Tennessee worked with men from our church to complete much of the labor on this building. Our pastor is Dr. Mark Ritchey. He and his wife, Heather are a welcome addition to our church family. We are certain he will lead us into the future that God has planned for Grand Prairie Baptist Church. There is a buzz of excitement in the air as we work to reach out to our community as the body of Christ should. GPBC's members have worked in and around the Auxvasse area for 175 years now and we do not plan to stop! We will continue reaching out to those who need to hear the Good News both in Auxvasse and around the world through participation in world mission programs. Our members love the Lord and are seeking His face to continue to carry out our part of His Great Commission. Won't you come and join us?